Under the guidance of teacher Vanessa Coppeto, a Human Development class at Valley Stream North High School participated in a service learning project that gave back to the community. After learning about stress management and controlling anxiety, the juniors and seniors found ways to decrease depression and minimize anxiety through pet therapy. The students started a fundraiser by making homemade dog treats and selling them to faculty members. With the money raised, they purchased a variety of dog beds to be donated to the Wantagh Animal Shelter. The educational coordinators from the shelter visited the class and discussed how the animal shelter works and how pet therapy helps those in need. It was informative and a great way for kids to see their fundraising efforts come full circle. 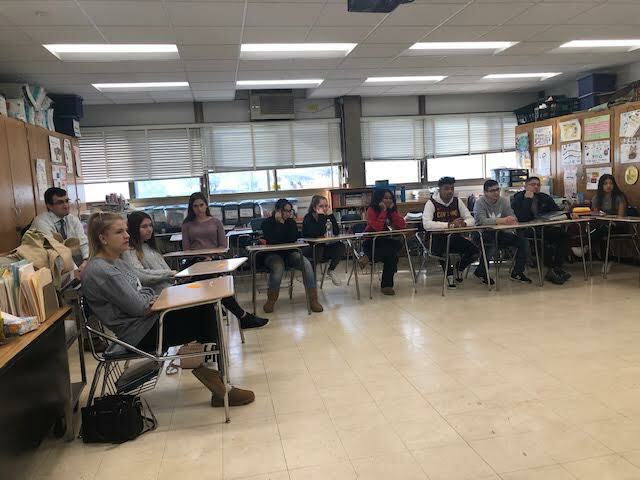 Photo Caption: North High School students listen to a presentation from Wantagh Animal Shelter educational coordinators following their effort to support pet therapy.